This compared to 4,000 during the previous year. In 2017, there were 25,338 visas issued for the B1/B2 category- these are the so-called non-immigrant visas for temporary visitors who are going to the US for business or pleasure. However in 2018, this fell to 4,923 Guyanese to whom visas were issued for holidaying purposes, almost 20,000 fewer than the previous year. There are no immediate explanations for the drop in the number of visitors’ visas issued to Guyanese by the US. The US Embassy earlier this week, during a media engagement with newly accredited Ambassador, Sarah-Ann Lynch, when questioned about the visas, pointed to online figures published at the State Department. Last year, too, the US Embassy became even busier after it was handed the job to interview Cubans for immigrants visa. 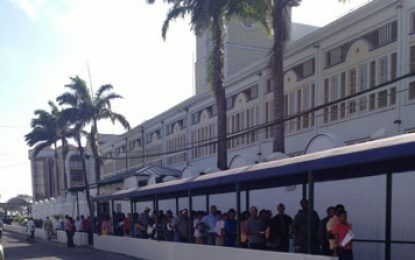 It is unclear whether Guyanese were just not interested anymore or that the number of applicants had hit its peak, or just that the US Embassy has reduced issuing visas. What is known is that the US Embassy has repeatedly said that the number of Guyanese who use the visitors’ visas to overstay is negligible. Guyana and the US have been enjoying a closer relationship especially with the recent discovery of a large quantity of oil. Years ago, there were significant rackets involving visas with Guyanese willing to pay millions of dollars to go to the US. One US embassy official was even jailed following a visa racket. In terms of immigrant visas, since 2008, the average number of persons who received visas to the US were around 4,500. In 2015, the US issued almost 7.2M visitors’ visas. This went down to 6.9M in 2016 but fell to 6.3M in 2017. For 2017, in the western hemisphere, of 28 nations, Guyana was ahead of 15 other countries in terms of the number of immigrant visas issued. At 4,096, it was ahead of Venezuela at 2,917; Trinidad and Tobago at 1,285; Suriname at zero; Barbados at 1,789 and Brazil at 3,502. Leading the western hemisphere for the number of visas issued in 2017 was Mexico at 86,876. The Dominican Republic was almost 50,000. El Salvador and Haiti also have a significant number of immigrants to the US. So does Jamaica.